- An SPL Meter provides measurement of sound levels using an A-weighting. - The Signal Generator provides a sine wave output up to 20,000Hz in 1 Hz steps, along with noise generators for white and pink noise. Three FFT sizes of 8192, 4096 and 2048 are selectable, giving fine resolution of frequencies. 6 different FFT window function types can be selected - Hamming, Hann, Rectangular, Bartlett, Triangular and Blackman. Number of FFT windows can be selected from 1 through 4. 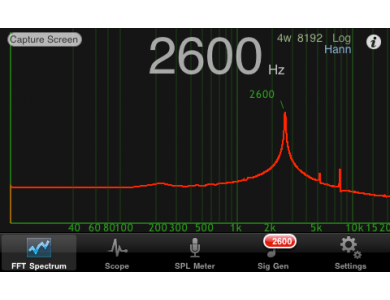 The SPL Meter continuously displays the sound pressure level, and has resettable minimum and maximum displays also. The sine wave frequency selected using picker wheels allows for accurate control of frequency to within 1Hz. Volume for the sine wave and noise signals is continuously adjustable. All parts of the App have direct access to a context sensitive help document.